When we mention BMW 3 Series, most of us will thought of a compact executive car manufactured by the German automaker. But I am not going to blog about the sedan but it is about what does 3 series related with day of today, February 27.. Yes.. without further ado, I am proudly to announce that I am now part of 3 Series Club, age 30. 30 years ago, I was born to a mixed marriage couple, be the baby sister to my four elder sibling. Life has been great for me until now and I am so grateful to Allah for everything. Anyway, age is just a number and I believe picture tells a thousand words. 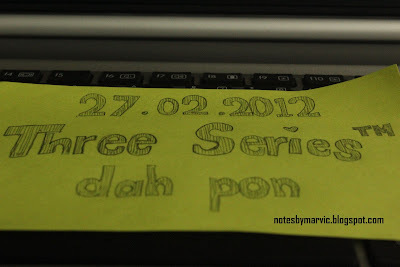 p/s: 3 Series dah.. Yay !!!! sweet nya lirik mr BF nyanyi tu.. hehe. captured your word.."so grateful to Allah for everything"
May Allah guide you to the right path. InshaAllah. Sweet 30th babe!!! welcome to the club. ahaks! Awwww gf yg sengal! How sweet hahaha. Hope u dpt pindah blk KL cpt so u can celerate with loved ones! Happy wonderful birthday. 3series...mahal tuh!